Our group of 20 enthusiastic walkers checked in to the historic Chateau Tongariro on a dull, rainy afternoon. 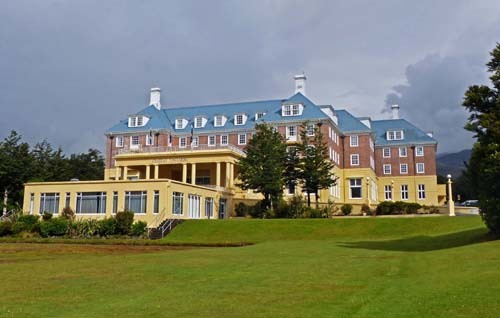 This stylish hotel is located in Tongariro National Park on New Zealand’s North Island. Built in the Roaring 20s to encourage tourism, it still retains an aura of timeless elegance. 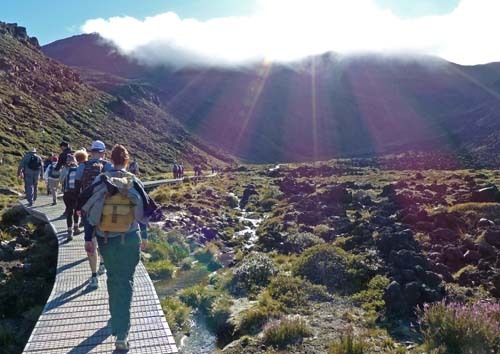 Our objective was to tackle the renowned Tongariro Alpine Crossing. This is a one of a kind, 7-9 hour, 19.4 km. (12 mile) hike with a 776 m. (2,500 ft.) elevation gain. The trail wends its way through a crazy quilt of geological features passing three lofty volcanoes, snow capped peaks, steaming fumaroles, giant lava fields and colourful alpine lakes. This region’s fascinating topography was formed by a multiplicity of powerful eruptions. We just needed favourable weather conditions. If heavy rain or strong winds are forecast, the Department of Conservation forbids entry to hikers. Nonetheless, we were well prepared. We had an experienced leader, food and water, raingear, sturdy boots, warm clothing, sun protection and walking poles. Just as importantly, my husband carried his trusty camera. The day dawned to reveal clear skies with a few fluffy white clouds. Two thumbs up! After a hearty breakfast, we hopped on the shuttle bus and bumped our way down a narrow unpaved track to the trailhead at Mangatepopo. It was barely 8 o’clock. At a starting altitude of 1,100 m. (3,650 ft.), there was a noticeable chill in the air. A huge throng of hikers was ready to set off. There were people of different nationalities ranging in age from 7 to 70 plus. “Watch your feet”, “look out for yourself”, and “hike at your own pace” were our leader’s words of wisdom. Heeding this advice we began our journey with a gentle ascent on a well groomed trail before heading across a raised boardwalk. It was a pedestrian highway. The younger people raced along scooting past us older slowpokes. On the lower slopes we passed tufts of tussock grass and patches of purple heather. The incline increased as we approached Soda Springs where there was a welcome “comfort” stop albeit with a short line-up. The outhouses, painted in camouflage and secured by steel guy ropes to the ground, merged with the environment. Rounding a corner, we were greeted by a bitter wind. It was time to don another layer. Next we climbed steadily to the saddle between Mt. Tongariro and Mt. 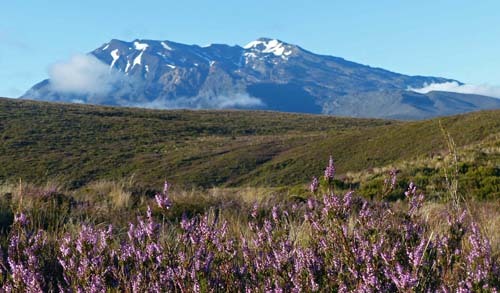 Ngauruhoe. These steps, the Devil’s Staircase, comprised the day’s greatest single elevation gain (200 m. or 650 ft.). Progressing slowly, footstep by short footstep, we all made it up successfully. 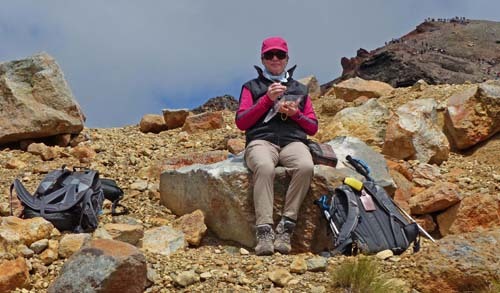 At the South Crater we rested awhile, had a welcome sip of water or hot tea and soaked up the views over the valley. The surrounding landscape had become increasingly barren. 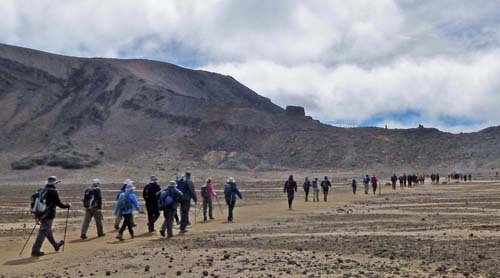 As we strolled across the golden earth of the South Crater’s wide flat basin, the scenery became more lunaresque. 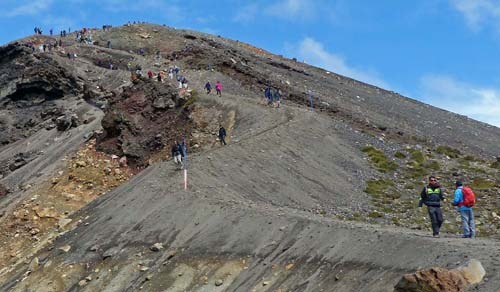 Continuing on, we trudged upward to the summit at 1,886 m. (6,224 ft.) This stretch is rockier and strewn with volcanic debris. We were thankful for our sturdy footwear. A short steep scramble took us along a somewhat exposed ridge where the presence of a fixed wire cable was reassuring. Then we were at the top. Victory! We were standing on the rim of the 3,000 year old Red Crater. Its exposed surfaces were colored in shades varying from dusky plum to burnt sienna. The reddish tint results from oxidized iron in the rock. Over time this amazing volcanic landscape has been characterized by sudden violent outbursts leaving behind old lava flows and chocolate brown scoria. It felt other-worldly. Our next challenge was a tricky descent. Ahead was a precipitous slope covered in loose scree and strewn with hidden boulders. We slipped and slithered our way down once or twice landing ignominiously on our backsides. Our adrenalin pumping at an all-time high, it was time to unwind and enjoy a quick lunch break. From my perch on a reasonably flat rock, the outlook to the vividly green Emerald Lakes was stunning. 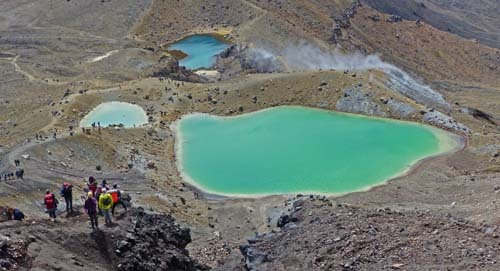 Beyond was the glistening Blue Lake which is sacred to the local Maori people. After crossing the Central Crater, there was just one more brief uphill push. Then we followed a long and winding downward trail for just over 1,120 m. (3,700 ft.) A never-ending series of switchbacks snaked their way through bands of scrubland, tussock grass, flax and manuka trees. In more protected spots, little white flowering plants struggled to survive. In the foreground, puffs of steam arose from geothermal vents. Way in the distance was Lake Taupo, the country’s largest lake. Several hours later, we passed the Ketetahi Shelter which evidences damage from the 2012 volcanic eruption. For a while the path passes through an “Active Volcanic Hazard Zone”. Heeding the posted notices, we moved quickly through this area. Eventually the pathway became predominantly flat. By late afternoon, we were walking through native forest beside a gently babbling stream. Wow! We’d done it! Even the driver of our shuttle was impressed by the group’s performance. 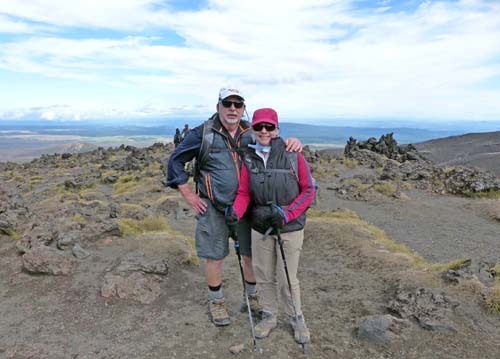 He proudly announced to the young hikers present that “even older people can complete this trail!” It was wonderful to return to the Chateau Tongariro. The healing powers of a hot bath worked magic on our aching joints. Over a celebratory dinner, we congratulated each other for completing this awe-inspiring Kiwi experience. It was certainly worth the effort.